The Blackberry Keyone was launched on 1st August, 2017 in India. The device comes with flick typing, with an ability to flick words onto your screen as you type. The device enables with touch gestures like a trackpad to quickly scroll through web pages or emails. The smartphone is secured with Blackberry security software, featuring DTEK security monitoring app, best in class monthly Android security updates and security built-in from the start. BlackBerry Hub is an irreplaceable tool for consolidating all of your messages in one place – whether it’s email, calendar, social or phone calls. Program each key to instantly bring up contacts and apps you use most often, such as pressing “B” to open browser. The Blackberry is available in Black color. The device comes with a 4.5 inches capacitive touchscreen display, with a screen resolution of 1080 x 1620 pixels and display type of IPS LCD (Gorilla Glass 4). The screen size features 24-bit colour depth and 3:2 aspect ratio. The smartphone makes use of an octa-core Qualcomm MSM8953 Snapdragon 625 that is coupled with 64-bit Adreno 506 GPU, 4GB RAM and 64GB storage default memory capacity. This storage can be expanded up to another 2TB with the help of a microSD Card. For imaging, the device sports a 12MP camera with 1080p@30fps, Geo Tagging, HDR, 4K Video recording, PDAF, 4x digital zoom, Panorama, burst, live filters. Up front, the smartphone makes use of a 8MP selfie camera, featuring image and video stabilisation, wide selfie mode, and multi-frame low light enhancement. The connectivity aspects include Wi-Fi 802.11 a/b/g/n/ac, dual-band, WiFi Direct, hotspot, v4.2, A2DP, LE, EDR, USB Type-c, OTG, with A-GPS, GLONASS, BDS and dual sim. The smartphone packs a 4.4v non-removable Li-Ion 3505 mah battery, with quick charge 3.0. The battery gets enabled with 50% charge in 36 minutes. The device runs Android 7.1(Nougat), out of the box. The sensors are Ambient light, Proximity, Accelerometer, Magnetometer, Gyroscope, Magnetic, Hall Effect and Fingerprint. The Blackberry KEYone price in India starts from Rs. 35,990 for 4GB and 64GB variant. BlackBerry KEYone has received a price cut of Rs. 6.024 taking it down to Rs. 33,975. This price cut hints that the BlackBerry KEY2 could be launched soon in India. Though the BlackBerry KEY2 is expected to arrive in India soon, it is yet to be officially confirmed by the company. BlackBerry Athena spotted on TENAA listing with Codenamed "Athena". 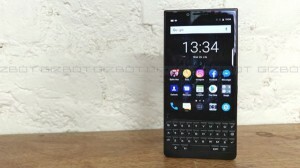 The listed phone doesn't come with the BlackBerry logo on the spacebar, which is a slight change from the original design of BlackBerry KEYOne. BlackBerry has received a nod from the World Intellectual patent Organization (WIPO) for a new camera design. Blackberry announced launch of two new smartphones by second half of 2018. BlackBerry announces Bronze edition KEYone.